Bringing our world to you! 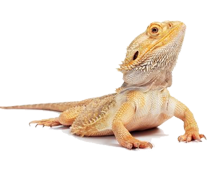 Amazing Animal Ambassadors offers several educational animal and reptile shows for kid’s birthday parties and special events throughout MA, RI and NH. The goal of Amazing Animal Ambassadors is to bring the natural wonders of our planet right to you, whether it is in your classroom, hometown event, or even a birthday party. Our live animal shows are designed for any age and are sure to amaze! With our unique variety of animals such as parrots, exotic mammals, large reptiles, and even insects from around the globe, we create an experience unlike any other. Programs are a hands-on hour long experience where you will learn about creatures from Africa, South America, Australia, Europe, Asia, and even right here in the United States. Get up close and personal with amazing animals brought to you by an experienced presenter for a safe and fun experience. You might even forget you’re learning something at the same time! We offer a variety of entertaining and educational live animal shows, featuring many age-appropriate combinations of animals for your event. During our presentation, audience members will have the opportunity to handle several animals that you may never have thought possible. We also provide great photo opportunities that make great souvenirs! There is a lot to learn about wildlife and our planet. Contact us early if you wish to schedule a presentation at home or at school. We highly recommended you book your program no less than three months in advance, as our schedule fills up quickly. Schools and other organizations may inquire about our discount rates. Are you looking for a unique and amazing birthday party idea? We have a variety of travel presentations that are a convenient way to bring our animals your next birthday party! Our birthday party packages come in many varieties, with lots of interesting facts and personalized interaction. Amazing Animal Ambassadors has a variety of educational live animal presentations that are memorable learning experiences for students of every age group. These classroom based programs add a dynamic dimension to many areas of study. Contact us today! We can add a little wildlife flare to your next group, public or corporate gathering! Amazing Animal Ambassadors can bring several exotic live animals to your self-hosted gathering and/or party. Your guests will get up close and experience a personal, memorable wildlife encounter. 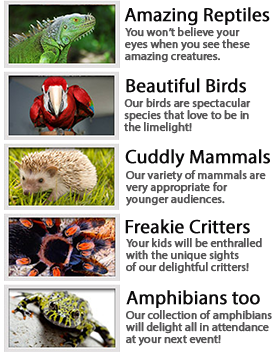 Amazing Animal Ambassadors is fully bonded and insured.